A note to regular WOW readers.. Last week's post now has a cover picture, seems I was just a week early for the cover image to appear on Amazon, so now that has been added to last week's post. Product Description: "The imprisonment and execution of Queen Anne Boleyn, Henry VIII's second wife, in May 1536 was unprecedented in the annals of English history. It was sensational in its day, and has exerted endless fascination over the minds of historians, novelists, dramatists, poets, artists and film-makers ever since. Anne was imprisoned in the Tower of London on 2 May 1536, and tried and found guilty of high treason on 15 May. Her supposed crimes included adultery with five men, one her own brother, and plotting the King's death. She was executed on 19 May 1536. Mystery surrounds the circumstances leading up to her arrest. Was it Henry VIII who, estranged from Anne, instructed Master Secretary Thomas Cromwell to fabricate evidence to get rid of her so that he could marry Jane Seymour? Or did Cromwell, for reasons of his own, construct a case against Anne and her faction, and then present compelling evidence before the King? Following the coronation of her daughter Elizabeth I as queen, Anne was venerated as a martyr and heroine of the English Reformation. Over the centuries, Anne has inspired many artistic and cultural works and, as a result, has remained ever-present in England's popular memory. 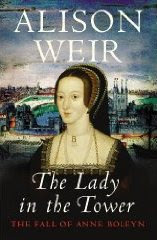 In her impressive new book, Alison Weir has woven a detailed and intricate portrait of the last days of one of the most influential and important figures in English history." While this is not just another biography of Anne herself, this focuses on the politics behind the trial of Anne, Anne's last days in imprisonment, and thus the execution. At 384 pages on the US version, this has got to be quite an intricate look at the devices behind the event. Too bad it wasn't released for the May 19th execution date, which would have been fitting. Anne was not the only one executed as a result of the adultery charges and this is a very tragic story which fascinates me still. I wonder what information will be shared about Jane Boleyn, Lady Rochford. I realize also that there are Historical fiction fans that -bluntly put - either love Weir or hate her. I haven't leaned either way yet. Still on the fence, but maybe when I read more of her works I'll get closer to forming my own conclusion. An interesting tidbit is that Alison's friend Tracy Borman (Elizabeth's Women) will join her September 9, 2009 when they each release their new books at the Tower of London. They will give a tour and have canapes. Event info here. I still have several of Alison Weir's books to read that sit patiently on my shelf. I have read her "Wars of The Roses", "The Princes in the Tower" and the fictional "Innocent Traitor" about Jane Grey, which I really enjoyed although it seemed to receive mixed reviews. Still need to read "The Life of Elizabeth I", and the fictional "The Lady Elizabeth", "Queen Isabella: Treachery and Adultery" and I would like to also purchase the one on Katherine Swynford, John of Gaunt's mistress turned wife. Alison is working on Henry II and Eleanor of Aquitaine fictional book now for 2010, and also has contracted for a sequel to "The Lady Elizabeth".